Guess what I just heard? We’re The Millers is coming out on DVD on November 19! That’s really a good news for those who love We’re The Millers or Aniston – the girl-next-door so much and for those who want to watch this film again and again. But before you order it for home entertainment, did you ever think about one thing? You really need to rip DVD We’re The Millers or backup DVD We’re The Millers to protect this original precious disc from being damaged due to the repeated uses or just convert DVD We’re The Millers to tablet or iPhone for convenient sharing with more friends. First let’s talk about this film and then tell you the best way to rip DVD We’re The Millers step-by-step. Keep reading! It seems that this film can’t get a higher score from the review aggregation website Rotten Tomatoes, which only gives the film score of 47% based on reviews from 142 critics. But according to the film’s box office, it’s exactly a financial success grossing over $144M in North American against a budget of $37M.This makes it the most financially successful comedy film of 2013!But as for me, this film truly makes me laugh out and it’s hard not to love it. If you decide to buy the DVD, right here let me show you how to backup DVD We’re The Millers better and faster. 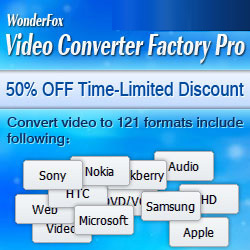 Well, no matter what you have in mind now, WonderFox DVD Video Converter could do you a big favor. It’s currently the best DVD copy software to rip DVD We’re The Millers or any other DVDs you have collected to the latest portable devices. This tool also allows you to convert between any video formats, download online video like YouTube, Facebook, Vimeo videos as well as enhance videos by editing. Next you can take a gander at below pictorial guide on how to rip DVD We’re The Millers in the most efficient way. Step 1: Insert the DVD disc of We’re The Millers into computer DVD-ROM. And then simply click “Load DVD” and you can choose which parts of this DVD to be loaded from 2 options – Main Movie and All Movies. Step 2: Then you need to choose an output video format or you can just select one portable device. Actually this DVD copy software supports 100 + formats like MOV, AVI, MP4, XviD, MPEG, FLV, 3GP and any more. Moreover, the devices supported include iPhone (iPhone 5S, iPhone 5C included), iPad, Samsung GALAXY series, Xbox 360, PSP, etc. Step 3: Hit “Run” to backup DVD We’re The Millers with the fastest conversion speed compared with others’ and with excellent video and audio quality! 2. Crop or clip the DVD and add special effects to touch up the DVD video. 4. Get quick support from Facebook. David Burke (Jason Sudeikis) is a small-time pot dealer whose clientele includes chefs and soccer moms, but no kids-after all, he has his scruples. So what could go wrong? Plenty. Preferring to keep a low profile for obvious reasons, he learns the hard way that no good deed goes unpunished when he tries to help out some local teens and winds up getting jumped by a trio of gutter punks. Stealing his stash and his cash, they leave him in major debt to his supplier, Brad (Ed Helms). In order to wipe the slate clean-and maintain a clean bill of health-David must now become a big-time drug smuggler by bringing Brad's latest shipment in from Mexico. Twisting the arms of his neighbors, cynical stripper Rose (Jennifer Aniston) and wannabe customer Kenny (Will Poulter), and the tatted-and-pierced streetwise teen Casey (Emma Roberts), he devises a foolproof plan. One fake wife, two pretend kids and a huge, shiny RV later, the "Millers" are headed south of the border for a Fourth of July weekend that is sure to end with a bang.